Steam traction engines will return to the Trevithick Day parade in Cornwall on Saturday after the event was banned last year. The parade was stopped following police fears over safety in the crowded west Cornwall town of Camborne. But organisers have mapped out a new route, which will include Camborne Hill for the first time. The local neighbourhood police officer says the new route appears to be popular with everyone. 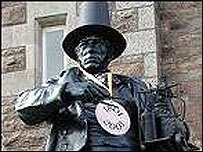 The parade, which attracts thousands of people to the town, celebrates the life of Richard Trevithick from Camborne. Known as a pioneer of the industrial revolution, the Cornish-born engineer invented a high pressure steam carriage known locally as the Puffing Devil, the world's first passenger-carrying road locomotive. The test run took place on Camborne Hill on Christmas Eve 1801 and the event is still remembered in a well-known Cornish folk song. Kingsley Rickard, the vice chairman of the organising committee, says the carriage was nicknamed Puffing Devil because it scared people living on Camborne Hill.